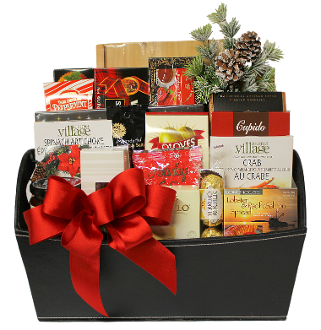 This gift basket is overflowing with classic gourmet items and seafood lover gourmet gifts. Products include: Elki Chili Crackers, Elki Sundried Tomato Crackers, Smokin' Joe's BC Smoked Salmon in Cedar Gift Box (227g), Cambridge & Thames Premium Tea Collection, Walker's Shortbread Fingers, Brown & Haley Dark Chocolate Peppermint Roca, Pralines Assorted Boxed Chocolates, Dibella Artisan Style Double Chocolate Fudge Biscotti, Gourmet Village Spinach Artichoke Dip Seasoning, Roasted Salted Pistachios, Oloves Mediterranean Snack Olives, Cupido Tiramisu Dessert Cups Boxed Chocolates, Gourmet Village Baked Crab Dip Seasonings, Smoked Oysters, Gourmet Village Red Pepper Jelly, Classic Mixed Nuts, Castello Brie Cheese, Rocher Hazelnut Chocolates 3pk, Longhouse Lobster & Salmon Spread, Jingle Java Holiday Coffee and Orange Crate Holiday Cheeseball Seasoning. Presented in a black pleather container.